The Gnomon Workshop - Drawing the Figure 1-2 with Jack Bosson (2011-2012) HDRip » Развлекательный портал Jolly Roger Project. Эта лекция является первой из серии о том, как подойти к разработке человеческой фигуры. В этой серии, Джек утверждает, что успешное рисование фигуры должно включать данные из трех наборов информации: жестов, структурных и анатомических, первый из которых в центре внимания данной демонстрации. 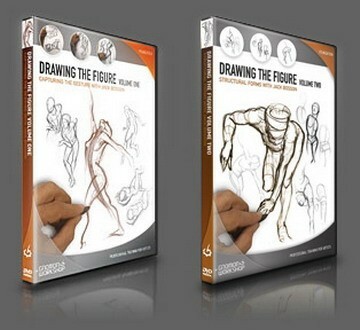 In this second DVD of the Drawing the Figure series, Jack explores the properties of structure. Here, he introduces the basic elements required to create the illusion of 3-Dimensional space and form as they apply to the human figure. By constructing simple forms, exploring overlap and translating the complexity of the human body into its simplest, most basic forms, we can begin to understand the process of converting a three-Dimensonal, real world form onto a flat, 2-Dimensional surface that an observer can understand. Jack will demonstrate how to see the forms and draw through them without losing the gestural quality described in his first DVD.